It is with great sadness that our family deals with the loss of our beloved friend, father, husband and the world’s best “opa”. Born Roelf Michel Rooijen, but known to all as “Rudy”, he was one in a million. He was well-loved and respected by his family and friends. 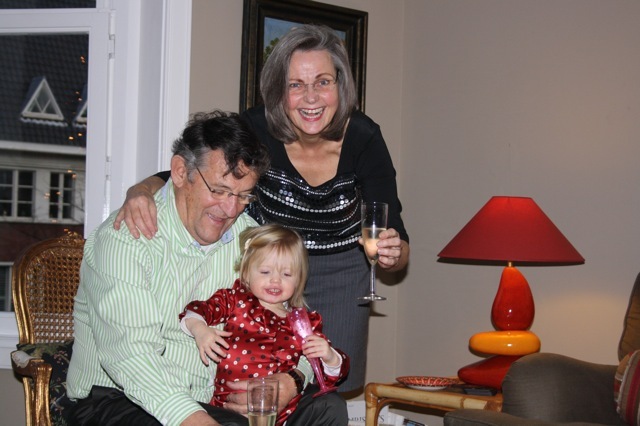 With his partner and equally wonderful wife, Evelien, he cherished his role as a grandparent and lived life to the fullest. Terry, Meg and I met the Rooijens when Terry’s daughter, Laura, met and married Rudy and Evelien’s (also wonderful) son, Michel Rooijen. Thereafter we shared our lives with them as our children and then our granddaughter, Sophia, brought us together in Amsterdam and in Kansas City. We celebrated Laura and Michel’s wedding in Maastricht, Sophia’s birth in Amsterdam, Thanksgiving in Amsterdam and barbecue in Kansas City. Our lives are far richer because of our friendship with this special family. His death was a horrible shock to all of us. A pillar of strength throughout his life, he seemed invincible. His death leaves a hole in our lives and our hearts. This entry was posted in Family and tagged One In A Million, Roelf Michel Rooijen, Rudy. Bookmark the permalink.